Linguazoom has been created and is actually directed by the Swiss Sylvia Halter. Already during her studies at the university in the German part of Switzerland she got involved with the integration of immigrants: she gave German and Swiss German courses to foreigners living in the German part of Switzerland. Fascinated by teaching languages she went after her studies to the French part of switzerland where she began in 2006 to develop her own language school, which she presided until 2008. Along with the administration of the school she also taught primarily business German in enterprises, but also everyday german for individuals. During her stay in western Switzerland she studied further the methodology and didactics of teaching German as a foreign language. 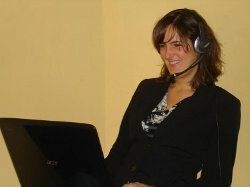 As she wanted to benefit more intensively from modern technologies of communication like skype or e-mail, she used her linguistic knowledge to develop her own online course didactics and applied them in the context of her Swiss language school. In 2009 she decided to apply herself exclusively to the domain of online courses and created the online language school Linguazoom. Sylvia Halter combines professional competence, reliability and personal dynamism in an optimal way. German, Swiss German, French, Italian or English is their mother tongue. They are dynamic, friendly and motivating!